BotsIQ: They’re building robots, we’re building a workforce. High school students design and engineer robots to duke it out! This unique manufacturing workforce-pipeline program was developed to reignite interest in Science, Technology, Engineering and Math (STEM) fields among our next generation. 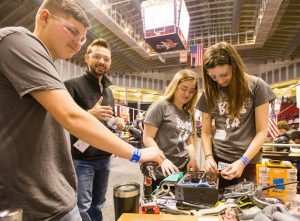 Students gain career exposure in this high school program through applied engineering, design and manufacturing skills to create the ultimate battle robot. Industry professionals act as team advisors throughout the design, prototype, build and repair phases. BotsIQ is supported by a consortium of local manufacturers in conjunction with New Century Careers to fund and operate the program and its events. For more information on BotsIQ, visit www.BotsIQpa.org.